On a recent shopping trip with my wife, we were in a quilting shop that is running a contest using your Turning Twenty quilt pattern book. The contest is for the ugliest quilt, but it must be made according to your pattern, using fat quarters. 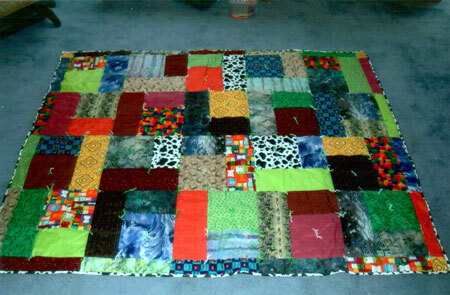 Photo of quilt is enclosed. These quilts will be judged and the ugliest one will receive a prize and all quilts entered will go to a local battered woman's shelter. My wife gave me a stack of fat quarters and I dug through them to find the ones I thought would look the worse together. I cut the fabric and laid out the quilt. My wife, Marilyn, stitched it together. I tied it with yarn. I do now know how the contest will turn out, but we had a lot of fun putting it together. We liked this quilt pattern so well that we bought the Turning Twenty...Again book and have chosen fat quarters that are a better match and have cut the pieces out. We will put it together soon.